Summary: The sixth blog entry for Gyakuten Saiban 6 (Ace Attorney 6 - Spirit of Justice) was posted on June 2, 2016 and was written by Akitsuki Chieko, who worked on effects in the game. 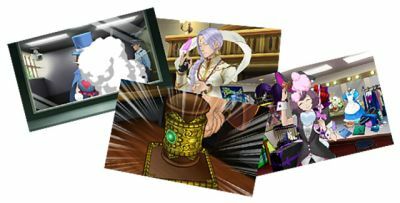 Ever since the first game, the Gyakuten Saiban series has been praised for its attention to lively presentation, and effects are of course an important part of that. Akitsuki first runs us through her other task in the team (keeping the snack table stocked), and then explains about how effects are used in the water mirror for the Spirit Channeling Vision (Divination Séance) system. She also discusses (and shows images of) a few of the rejected design ideas for spirit channeling, which were quite different than the one we got in the final product. Nice to meet you. My name is Akitsuki, and I worked on the effects in Gyakuten Saiban 6 (Ace Attorney 6- Spirit of Justice). What is the first thing that comes up mind when I say effects? Perhaps magic, explosions, fire, pillars of water or lightning?? With Gyakuten Saiban 6, working on effects mean gathering vegetables and fruits from the mountains, and sharing them with all those young people who live alone and don't eat enough vegetables, and also putting loads and loads of snacks every week on the empty snack table! The most poular ones are the mantō and the salty senbei!! No, that's a lie (but it's mostly true). If I need to describe them, I would say that most effects are either the result of certain actions, or the visualization of otherwise invisible results of those actions. Have you all played the demo already? This time we have the Kingdom of Kurain (Kingdom of Khura'in), a country with a culture where spirit channeling is part of everyday life. 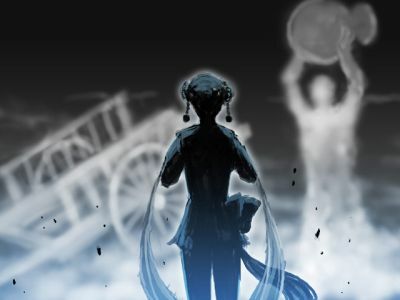 Within the courtroom of this country, a priestress performs the Dance of Devotion, and shows the Spirit Oracle, where the senses of the deceased moments before their death are projected into a water mirror (the new mechanic Spirit Channeling Vision (Divination Séance)). I want to talk about effects using the Spirt Channeling Vision as an example. We had several designs before we finally settled on the system where we'd project something in a water mirror. We had designs where a puppet would be possessed, and one where smoke would be coming out of large incense burner, and the crime scene would be recreated with the smoke. All of them were very mysterious-looking and scary. But the most important is that the mechanic worked as a game, so anything that wasn't fun to play was out! The design where we'd project something on a water mirror was eventually chosen out of the many designs, and then we started work on the effects. 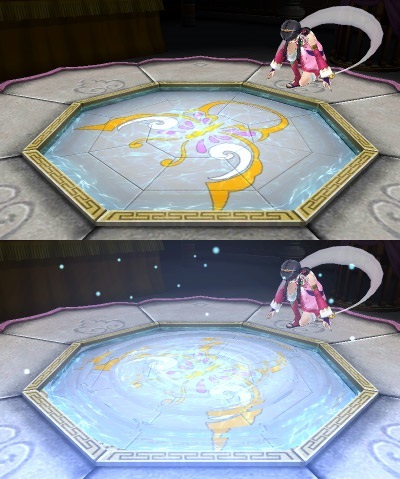 The task the effects section got for the Spirit Channeling Vision was to design a mysterious water mirror, with an occult spirit channeling touch, that would fit in the world of Gyakuten Saiban . During the vision, it had to be both water and a mirror, and it also needed to be easy to look at because words representing the five senses would float on it... So as we paid attention to the fact it would became a playable game screen, we went through countless of pictures and movies of seas, swimming pools, water pools and lakes. After a lot of creating, and deletion to get it to fit with Gyakuten Saiban, we finally arrived at this. Take a look at this trailer. It was only on for a second, but did you see the water mirror?? (Around 0:39). That shot of the water mirror was taken especially from a different angle... Usually, it's a very calm water mirror (upper), but once spiritual energy enters it (and effects), it looks like this (lower)! We make things that make you say: "Eh!? You do that with effects too!!???" And we also have things that make you say: "Eh? You don't do that with effects!!???" It'd be nice if I could talk about that another time. And that was the story about the effects in Gyakuten Saiban 6. I'd be glad if you could think about this a bit while playing. Next time is Fukuda, who wrote the scenario and is a big lover of mystery fiction!! I heard he's going to reveal for the first time how a scenario is made! 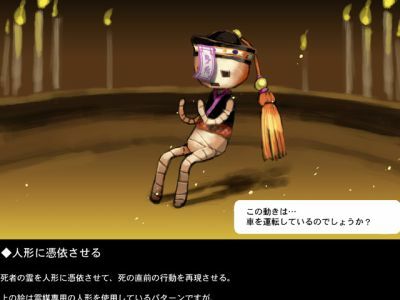 I hope you will also read the next developer's blog~!